HOLY COW!!! What happened here? This doesn’t look good at all. There has been a lot of panic caused by this, and I will tel you how it happened. You just have to read along to see. Don’t scroll down and cheat!! Hey, get back up here! So, this is how it all started. I was getting ready for bed on Wednesday night and I was looking at the weather. Thin, high clouds for the most part during the day with some increased clouds in the last hours of daylight. Fundamentally, this was not going to be a day I was going to want to get out and do any photography. I planned on washing the 4Runner and putting it away for the weekend all nice and clean. If I were to go out, I would head out right before sunset to a lake and work on some long exposure photography if the clouds were dramatic enough. If I didn’t get out, it wasn’t going to be an issue. I have had a lot of great luck behind the camera lately. I can’t remember a time when I had this many pictures being added in so quickly. I don’t know what that is all about either. 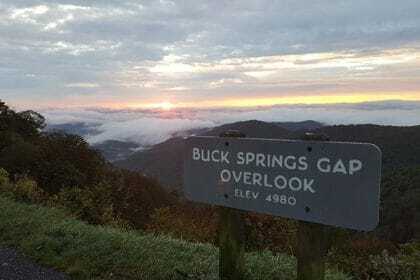 Normally by this point during the change of seasons, I am having a hard time finding things to photograph and am anxiously awaiting the mountains to get some color going on. I’m finding myself stumbling onto so many different subjects that are just ripe for the current season. I’m not complaining at all, I think it is fantastic, and I’m enjoying it while I can because I know there will be a tremendous slump coming soon. That is just part of being a photographer I’ve learned. When I woke up this morning I was getting ready and not giving a second thought to any photography. I got on the computer and did my morning social media postings and worked on a few emails after adding another participant to my Summer Landscape Workshop. It was a pretty standard morning as Sierra was getting ready for school. As the sun came up I was noticing that the clouds were looking really nice…much different than I expected. I got to thinking that I might be able to get that long exposure work done at Salem Lake this morning which would be much better for the lighting. I went ahead and grabbed my gear and loaded it in the truck (which was still dirty) and got ready to do some shooting after dropping Sierra off at school. As I was headed to the school, I was looking at the sky. To the West it was awesome, but to the East…well, there was a large strip at the horizon that had no texture and was blown out. This was the direction that I would be shooting in at the lake, so I started to reconsider my options. Looking at the sky as a whole, I was seeing a lot of possibilities with diffused light and textures in the sky. 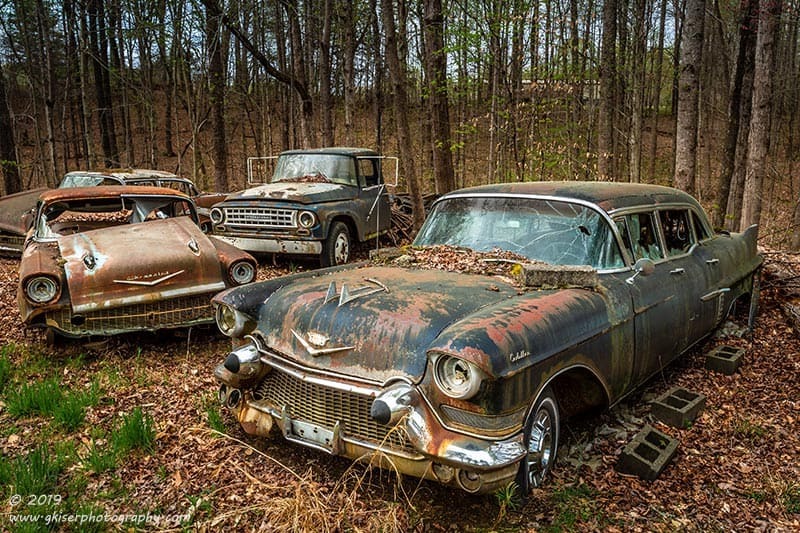 This was a perfect scenario for doing a rural tour and finding barns and old cars. I even had an old car in mind which wasn’t too far away. 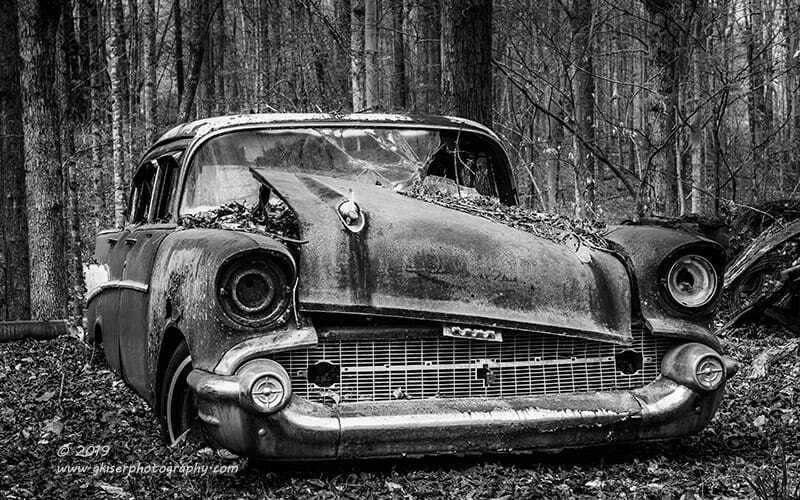 I dropped Sierra off and set off to the North where this one old sedan has been eluding me for about a month now. On the way there, I made another stop at a house where I’ve been wanting to shoot a car in the back yard. The conditions were fantastic for this one, so I stopped and knocked on the door. As seems to be the rule with this car, nobody answered despite there being a lot of cars in the driveway. I decided to cut my time lost and I just got back into the truck and headed out to the destination I had originally set. As I got close to the car I could see that the sky was looking perfect for this one. I had an idea how I wanted to shoot it, but until I got out and scoped it out, I wasn’t sure if it would work. I knew that I wanted to try it though. I saw the same cars in the driveway, but in different places. I was hoping that I would get lucky with knocking on the door here. I got out and went to the door. I knocked and got the same answer as always….barking. This is the fifth time in about a month that I have knocked on this door and I’ve gotten the same response every time. The problem is, the door would never open up. Figuring at this point that the residents just didn’t want to speak with me, I decided to try something a little different to keep me from having to come back out here time and time again. 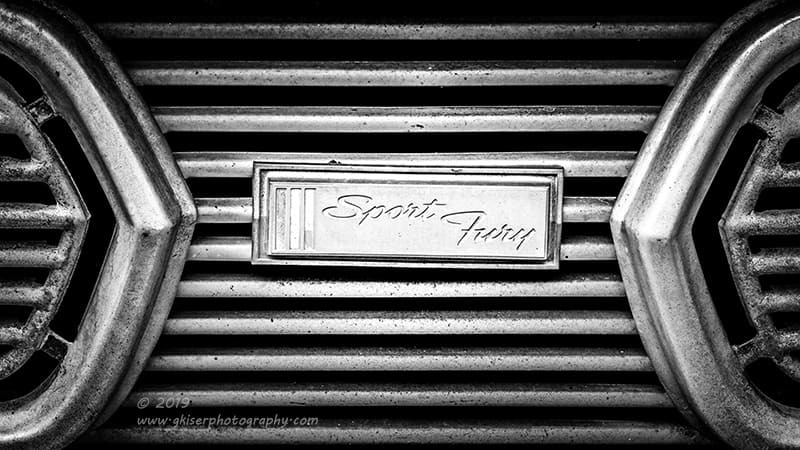 I went back to the truck and got a business card which I flipped over and wrote a quick note requesting to photograph the ’40’s sedan by the driveway, and to please call when convenient. Sometimes this works, other times it doesn’t. I just knew that I really wanted to get this car and it wasn’t looking promising at all at the rate I was going. I left the card in the door and went back to the truck tail between my legs which was becoming all too familiar for me. From here I started to really wonder if I was going to get anywhere to take advantage of the beautiful sky. I started to weigh my options, knowing that the light would change as the morning progressed. I decided as a last resort, I would follow up on a shoot that I had discussed a couple of weeks back. While shooting at this particular shop which I swore to keep private, I had learned that the owner had more cars at his home. He had graciously invited me to come and shoot these cars when the weather was right. Not wanting to pull too many favors in quick succession, I was a little hesitant to call and ask if I could come and work the cars at his home. Looking at the sky, I knew I needed something fast and I wasn’t too far off from the property. I made the call and was relieved when he answered the phone. He gladly invited me over and let me know where to park in relation to where the cars were. This was going to be fun, and I had no idea what I was going to find. It didn’t take long to get to his house and I pulled around back where I was told to park. From here, I could see a handful of cars behind the garage, and then it looked like there were a bunch of cars over on the side lot. I’ll have to admit, I was getting excited about this already. Just seeing the grill on the Plymouth got me giddy thinking about isolations. The owner came down to greet me and we chatted briefly before he turned me loose on this collection of automobiles which made his shop a little less impressive. I went around back to get a closer look at the Plymouth I had seen. 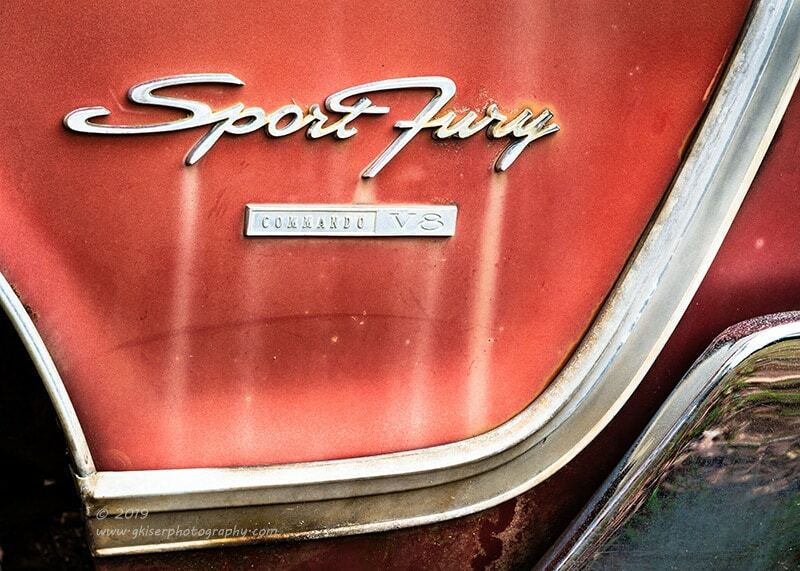 It was a Sport Fury and was a fantastic specimen of a car. It was not without its difficulties though. There was a Toyota Celica just to the rear, a late 80’s Fox Body Mustang to the left, and a pile of bricks to the right. Having photographed a good deal in tight quarters I was well prepared for this fortunately. I started out with my 70-200mm lens with a Singh-Ray Color Combo Polarizer to allow some isolation shots and hopefully a tight overall shot of the car. 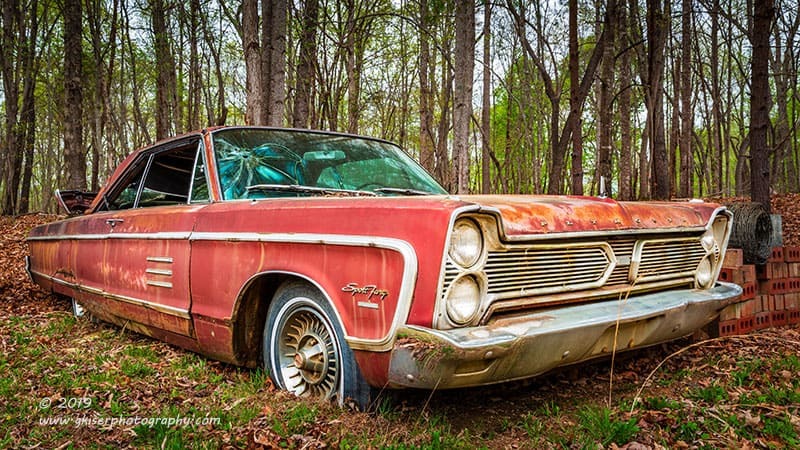 The images here are in order that shot them in, so the grille was the first of the series. 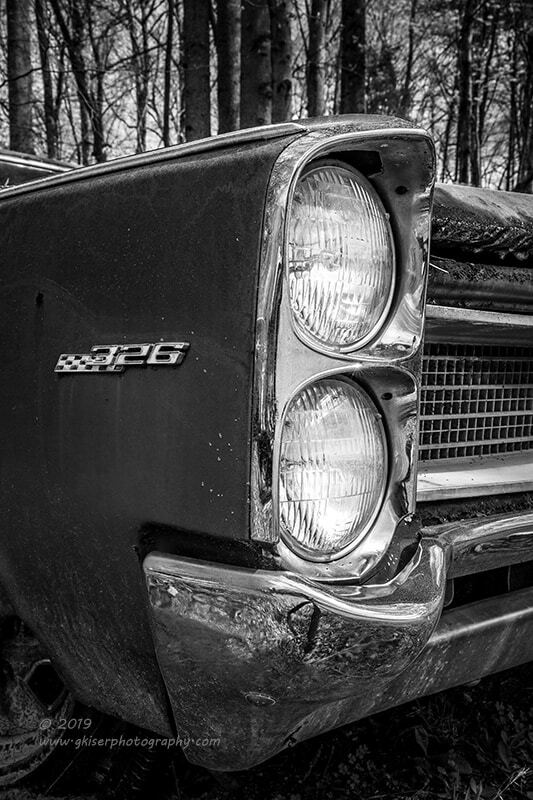 Since there wasn’t much color in the grill, I shot this with a monochrome presentation in mind. I kept it symmetrical with the grill trim as the frames on both sides of the grill emblem. I did a high contrast conversion to really accentuate the lines and shapes. 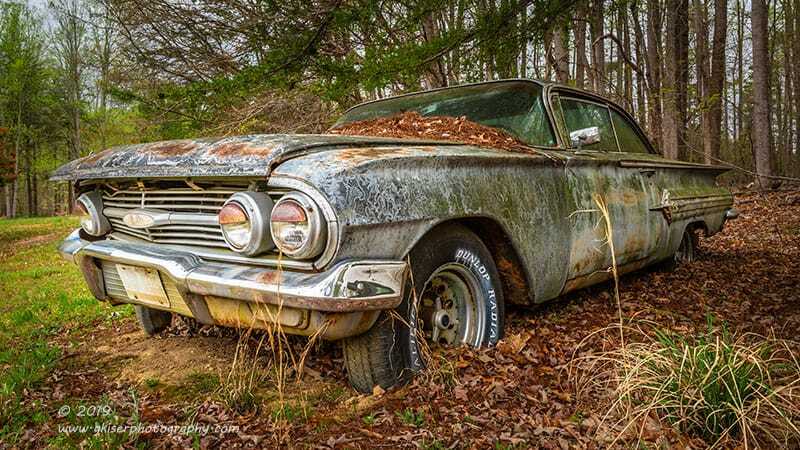 Of course the condition of the chrome added to the grit of the scene. I was well on my way at this point. That first image is always the hardest to get out of the way. From there, things started to come a little easier. I worked on my typical isolations of the hood ornament as well as the fender trim. As I was trying to get the all over shot, I realized that I didn’t have room to use my long lens for a suitable composition. I switched out to my workhorse 24-70mm which allowed me to get in a bit closer. By getting low, I was able to conceal the Toyota behind the Plymouth to where you wouldn’t even know it was there. Not wanting to waste all of the good light on a single car I started to explore a bit to see what else was out there. Not too far down the way was an Impala that was looking pretty good in the trees. Again, I was faced with some obstacles on the opposite side which I wanted to avoid in the composition. I was able to get down low enough to block the view of the other cars with the main subject and I was able to get a dramatic composition by getting in close and wide. The benefit to this position was it was hard to see the significant damage to the passenger side fender and headlight. I actually only shot two different compositions of this view with this one being my favorite with the tuft of grass in the lower right corner for balance. 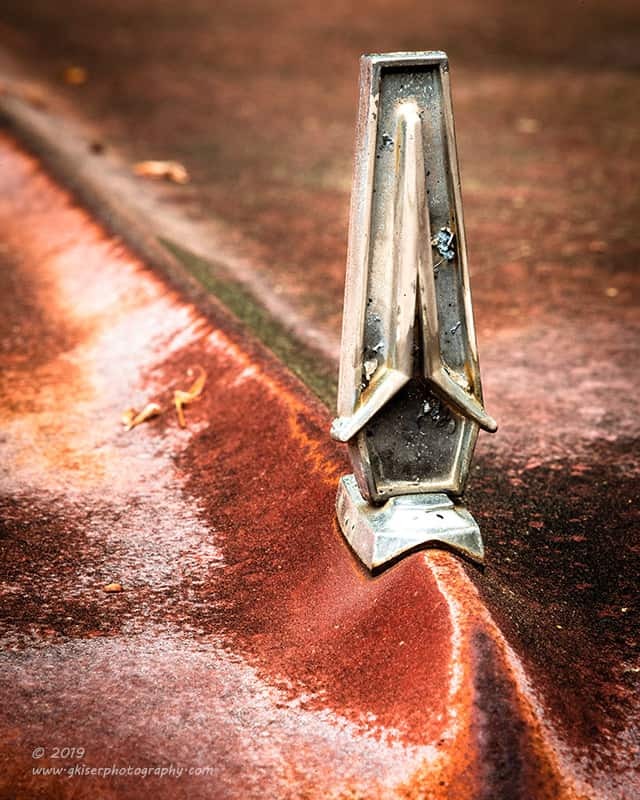 The patina on this car was wicked, and I really enjoyed seeing the textures in the fender. The title comes from the lids over the headlights. Back in the day, these would have been bright chrome, but now they are a rusty eyelid over some very tired Impala eyes. 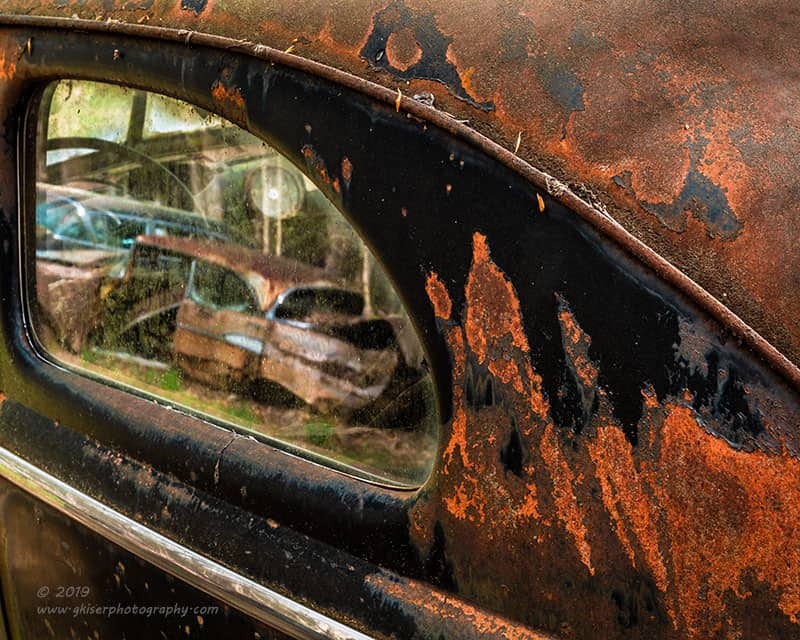 I wanted to get something to show off the patina of this car, and looking at what I had to work with, I saw just the composition that I wanted. The chrome quarter trim was just the ticket. There was a dramatic arrow at the lead with two strips of chrome framing the car’s logo. The moss and rust were resplendent on the light blue paint. I had to set the camera up basically right next to the neighboring car and use liveview to compose the image since I couldn’t wedge my big head between the car and the camera. It worked out well though, and I dialed in the exposure and focus and shot one frame. This was all I needed and I knew I had what I wanted. I worked my way around the car two times and wasn’t able to find anything else to shoot. Well, I did try to shoot the rear bumper and tail lights, but there were batteries stacked up to the rear that prevented me from getting that composition the way I wanted it. This was an awesome car, but I didn’t want to wait any longer before moving down to the lower yard where I saw so much more waiting on me and the camera. I passed by a cluster of trucks and buses that really didn’t appeal to me because what I saw just down the hill was much more impressive. There was an El Camino, another Impala, and looked like a whole slew of Tri-5 Chevrolets, and what I was pretty sure was a Cadillac Limo. Yep, this was going to be a lot of fun. 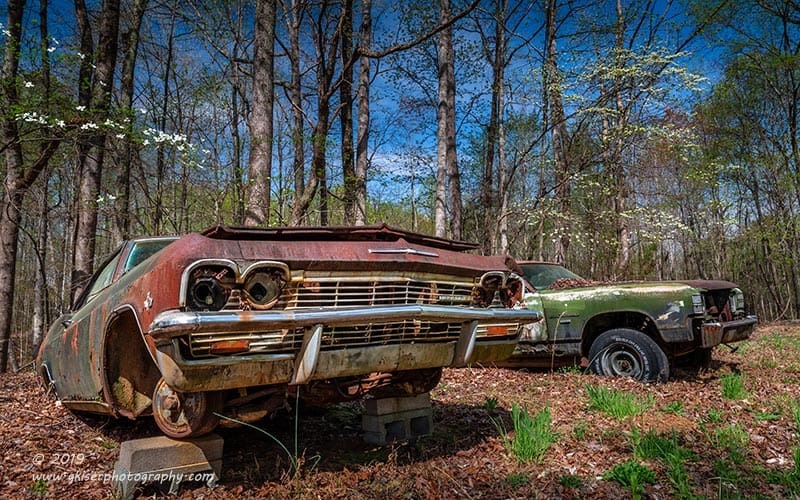 I started out with the El Camino and Impala but quickly learned that the sky above was too bright to capture in one exposure. I added the adapter ring for the Lee Filter Holder and slid in my Singh-Ray, Galen Rowell 3-Stop Soft Edge ND Grad and started to compose the images. This was giving me vignetting which I expected with the thick Singh-Ray Color Combo Polarizer, but I didn’t want to lose the color qualities of this filter in favor of the thinner B+W Polarizer. Instead, I just ultimately swapped out my lens for the 16-35mm piece and moved all the filters over to it. I was working with some awkward light and I decided to move over to another group until the light changed a bit. I found the cluster of Tri-5’s to be much better to work with. Using the setup that I had switched to, I managed to find some really good compositions on the wide end. I really wanted to take advantage of the Limo as the foreground anchor. The other Chevy balanced it out well with the International truck filling in the void. I got a little altitude for this shot in order to capture all three of the cars and give a slightly different perspective. The cinder blocks were something that I struggled with at the time of capture, but after seeing the final image, they make perfect sense with the image and I’m glad that they were there. They help to keep your eyes engaged in the frame quite well. 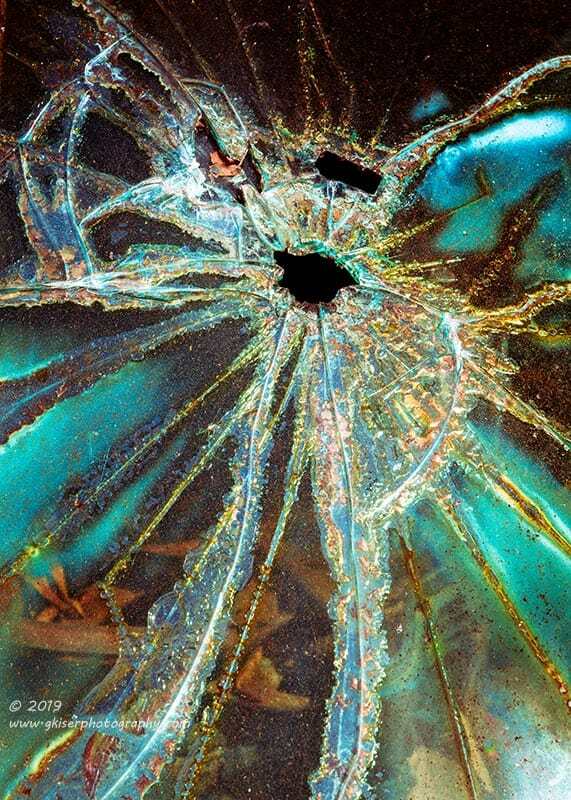 Of course, you know I love that big hole in the windshield as old glass has a beautiful look to it when it is broken. I worked around these cars for a while and found that the sun was starting to come out. Normally, I would have called it a day at this point and packed everything in. I would have, but I wasn’t finished with the day. There was still more to shoot, and one thing I love about automotive photography like this is I can shoot in a lot of different kinds of conditions with success. I knew that the light would be changing rapidly so I was going to need to stay aware of what it was doing in all locations. For instance, there was still some diffused light a bit further along the property where there was a ’40’s coupe sitting without a front clip. I moved over there to see if I could get anything. There was an orange tarp over the rear of the car, and not much I could use as a background shooting the body lines. 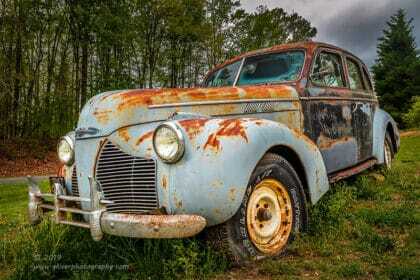 The rust was really great on this car though and I didn’t want to let it escape. I was desperately looking for something to shoot with this car and started to look inside the cabin at the dash. The windows were a bit to crusty to allow a good shot like that….but wait….what if I let the glass reflect. I was seeing part of the Chevy in the quarter window. I started to position the camera in just the right spot to show off the patina and the body lines while keeping the Chevy in the glass. I was very careful about how much effect I dialed into the polarizer and exposed an image that captured a really good image of the Chevy. You could also just make out the interior of the coupe so I counted this as a double….triple win. it is an odd image for me, but one that I really like and I think it stands out well. One of the things that I mentioned in my last workshop was that when the lighting gets harsh, start thinking about black and white photography. This image is the perfect example of that. It solved a couple of problems that I had with this scene. First and foremost, I had the back of the International truck visible to the right. Fortunately, it was only the rear wheels covered in some ground clutter. It was enough to provide a slight distraction. Second, the light was pretty bright and the hues on the car were fairly uniform and brown which matched the ground. This took most of the pop away from the car and it just didn’t really stand out well from the background. By doing a conversion, I was able to tweak the tones a bit and bring some pop back into the image. The clutter to the right was no longer a problem, and the low position of the camera blocked the tires of the truck. it also accentuated the low stance of the Chevy. What I really liked about this was the balance of the front end. The hood bullet was missing on the same side that the headlight bucket was present. Where the bullet was still attached, the headlight area was empty. To keep this from being static, the hood was cocked off to the side giving a bit of drama to the front end. It was a weak image in color, but presenting it as a monochrome image gives it a new lease on life I think. With the sun in a different position now, and the lighting become more and more flat again, I decided to head back over to the Impala and try some more compositions on it. I was liking this car less and less since it was elevated on blocks in the front and it was parked right next to the El Camino which seemed to overpower it in any composition that I tried. 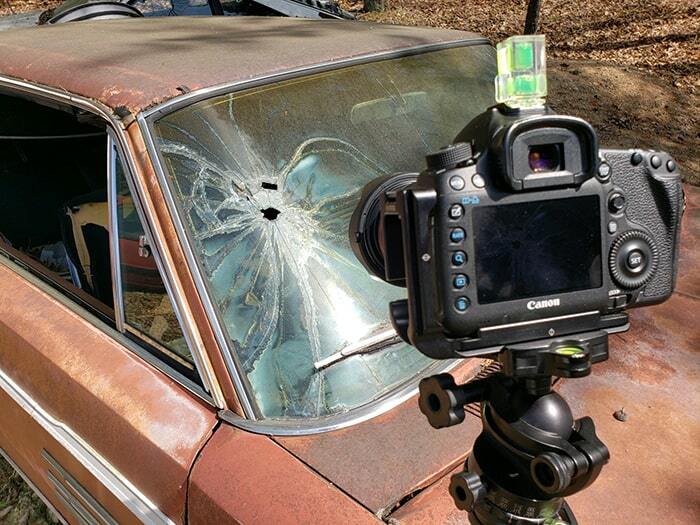 If I shot from the other direction, I had another Impala which had a hood full of bumpers that didn’t flow well. It was just going to be really hard to find a composition that I really liked of this car. I decided to go in close and get some isolations of the fender badging which had caught my eye. 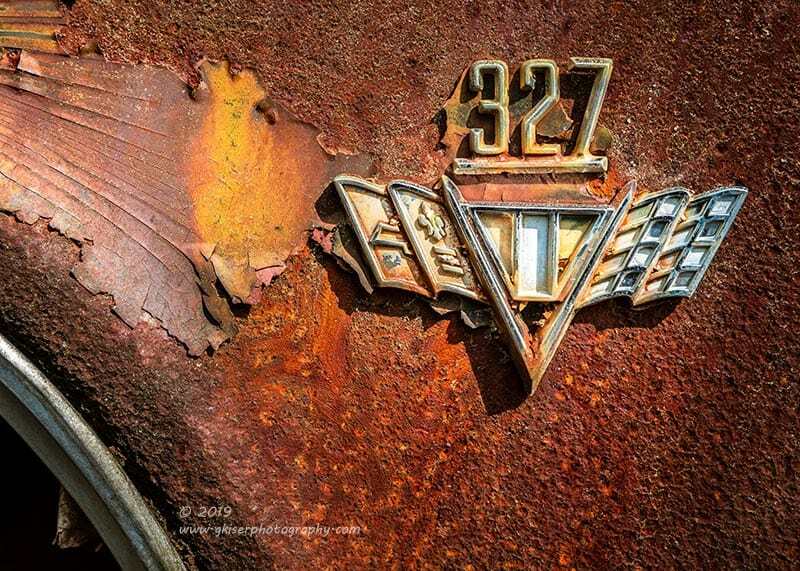 The textures of the rust beneath the emblem were fantastic and there was even a strip of paint to the left that added to the textures and threw in some diagonal lines to boot. 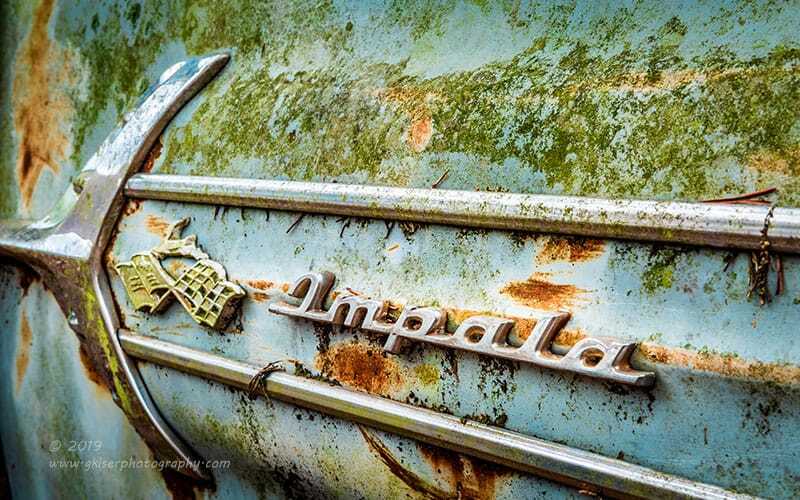 This actually turned into my favorite image of the old Impala despite having shot a number of images of it to this point. Figuring out that it was just not meant to be with the Impala, I moved back to the Cadillac that I had been having so much fun with. 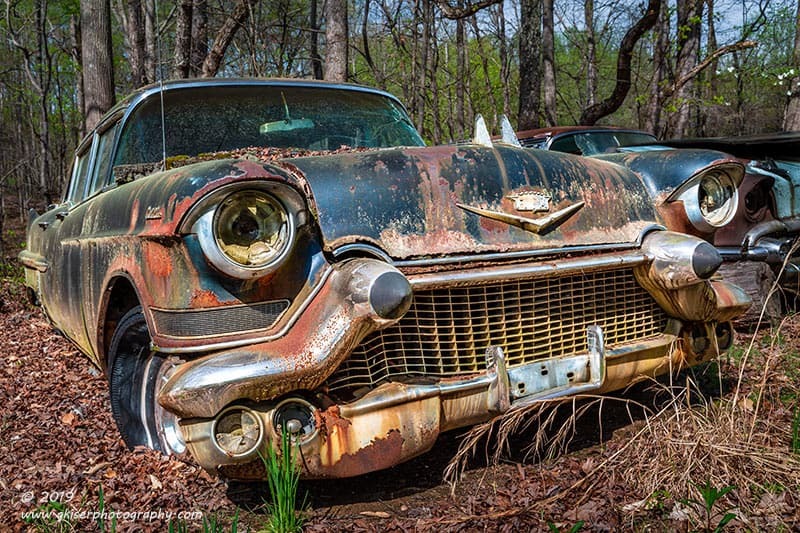 This reminded me all too well about the contract shoot that I did on the rat rod Limo last year. It was in much better shape than this one, but darn if this one didn’t have a fantastic patina to it. The glaze of pollen made it that much more interesting. I got down low with the 24-70mm lens and allowed the massive front end to fill the frame. Even without headlights this car had so much personality to it. 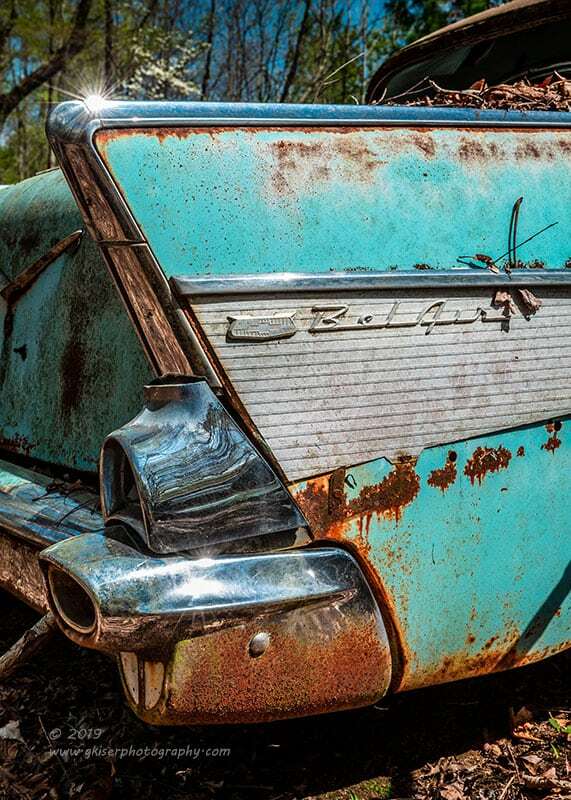 The warm tones of the aged chrome matched up with the rust so well. The black paint still had a stately look to it, and that one sprig of green provided some really nice neutral color right where it was needed. This car was really impressive, and I am starting to really enjoy shooting these old limousines. I kept moving around and wanted to get a composition of this rusty four door that was sitting on the ground. It had played a supporting role in several other shots I had done, but I wanted to give it a chance to shine all on its own. I got in low to help camouflage the other vehicles around it. This was no easy task considering it was resting on its frame! I was able to get the angle that I needed and the exposure was looking pretty good except for the sky. That was pretty bright and was threatening to blow out when I released the shutter. I grabbed my Lee Filter holder one more times and slid in that 3-Stop ND Grad which brought the sky right back in line with the foreground. When it comes to trees, I don’t like to bracket since I can’t control the movement and I don’t like the ghosting that happens in the breeze with an HDR image. This was a single shot that worked just perfectly even though the front of the car was in the shadows. I actually lucked out that the windshield was broken since it eliminated the glare that the sun would have caused. You can actually see a bit of it in the lower remains of the windshield. That would have been much too much for me to deal with in post production. I was just too close to the Limo not to be distracted by it once again. I just don’t know what it is about these cars that just draws me in. 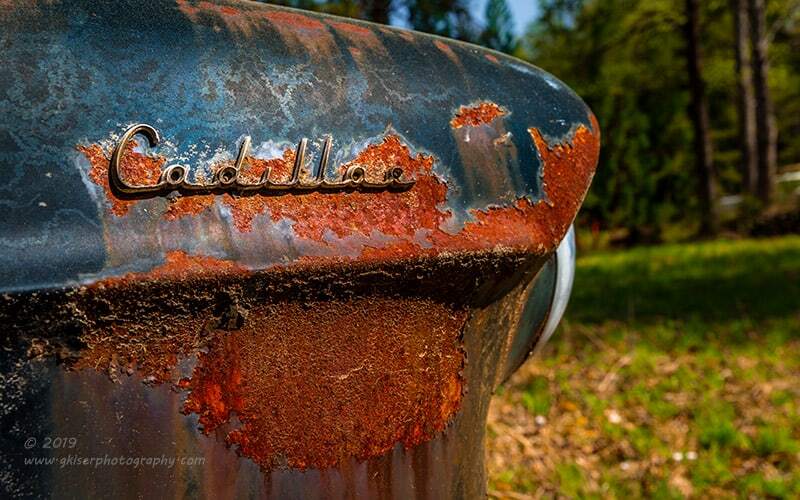 This time, I wanted to get in close and get the “Cadillac” script against the textured rust. I tried and tried to get a composition that I liked, but it just wasn’t working. I figured I would try getting something that included the woods in the distance with a little bit of bokeh added in to keep the attention on the fender. As I was framing this up, I could tell it was going to work very well. It was dramatic and showcased the script better than any other composition that I had tried. An added bonus was the tones of the grass that balanced out the very hot rust tones and cool black paint of the fender. The greens and yellows balanced things out quite nicely. The pop of chrome was also a nice addition to help break up the two sections of the image. As if I needed any more help in this composition, I had a grove of trees to the right that framed the shot ever so subtly. I love it when shots go this well after struggling with them initially. While I was in the frame of mind for isolations, I moved over the beautiful turquoise Bel Air next to the Limo. I moved around to the rear of it so that I could get the aluminum panel on the quarter with the chrome bumper. With the sun out, I was having a hard time with highlights on the chrome, but instead of fighting them, I went ahead and embraced them. I stopped the lens down to give me a bit of a starburst effect and positioned the camera where I would get a really big glare off of the top of the chrome trim. This worked out really well with the deep blue sky above complimenting the lighter hues below. The rust gave the right color balance to the entire image as well. I just really like this color when it comes to showcasing rust! Since the light was looking good in this direction, I went back over to the Impala once again to see if I could do anything with it. It still wasn’t working out, but I was seeing a lot of promise in the El Camino sitting next to it. I moved my attention over there, and once again saw that the sky was a little bright. In order to bring the blues back in, I added my Lee Filter Holder and slid the 3-Stop ND Grad back in. This gave a nice gradual transition which kept the sky in check rather well. The greens on the El Camino were vibrant in the late morning sun and I was glad that I had waited a bit for this one. It looked fine in the overcast light, but this sunlight was giving it much more depth and color. The trick with this car, like many of the others was to get down low. The difference was this time it was not to disguise the other cars or other clutter behind it. It just provided a more dramatic composition and angles. Getting in close made for a really prominent front end which I like, and the white blooms on the tree to the right balanced things out very well in this image. I’m going to side track for just a second here. 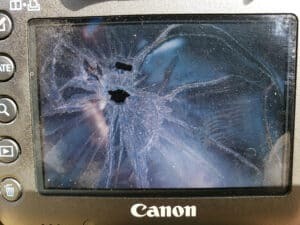 No, I’m not going to explain what happened to the camera just yet. All this talk about the Impala and all of the shots that I took of it had really gotten me thinking about this. I had spent a lot of time working on this car and it was rather sad that I had nothing to show of it. I had pulled three different images of it for possible editing, but had ultimately eliminated all of them. As I was writing, I reminded myself of something about this blog. 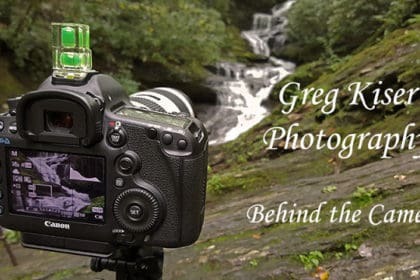 I use it to tell the story of what I shot for the day. They don’t all have to be gallery images, and I really wanted something here to represent the Impala. I went back into Lightroom and pulled in the three images that I liked best and started to look at them once again. 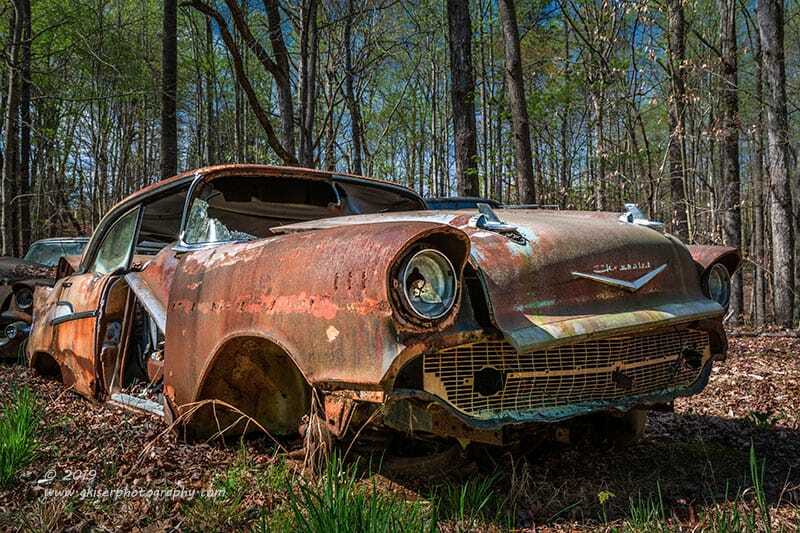 I started to see a little promise to this one which happened to be shot just after I had done the El Camino. It wasn’t perfect, but it did show the setting I was having to deal with. 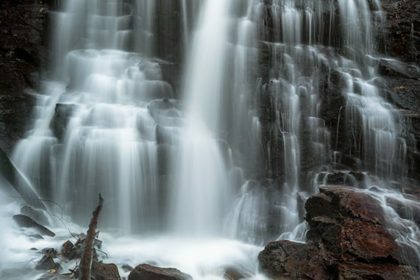 This one benefited from a 2-Stop ND Grad filter to control the sky as the light was ever changing at this point in the morning. I still liked the white blooms in the trees, and with the crop that I wanted to give it, I lost the vignetting on the corners since I went with a 16:10 crop. There really is something about the grill of an Impala that just begs to be showcased. Because of that I never really minded the car being on blocks, I was just really hoping for a more simple composition. At least the El Camino is from the same basic era which helped. It could have been the late 80’s Pulsar NX that was next to the Bel Air. Getting back on track with my story, I felt that I had done all that I could do at the lower portion of the yard. I wanted to see if the new light was providing any new opportunities up around the original area I started at. I passed by the trucks and the old bus once again as it still held no interest for me. I got up where the other Impala was and didn’t really see anything new or different there. 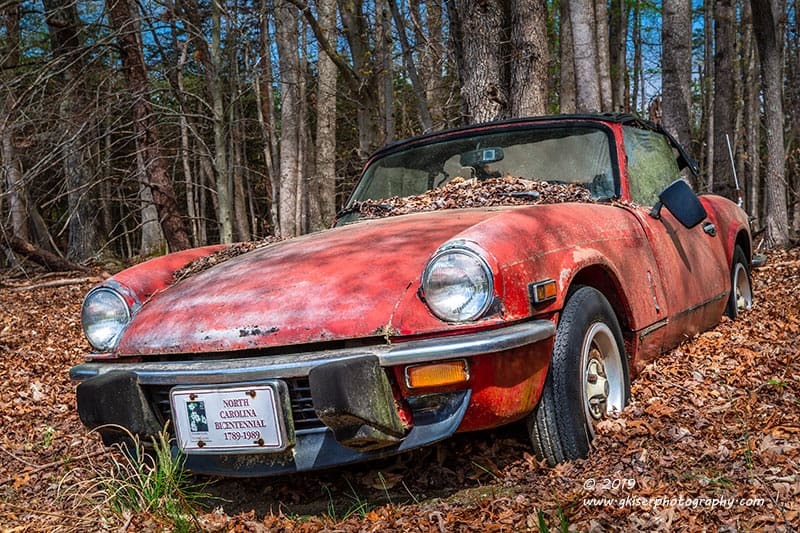 I did see some promise in what I am pretty sure is a Triumph convertible. The sun was hitting the red paint and showing off the age of it. I got down low once again and framed up a shot that appeared to be level. When I checked the spirit level on the camera I realized that I was way off. I corrected the angle of the camera and really liked the dramatic lean of the car. I had to be really careful to keep the sun at bay on the front tag since it was so easy to blow the white background out. I finally found the right composition and dialed in the exposure and focus before releasing the shutter. Click….and one that I was really happy with. Who said you can’t shoot at mid day? Here I was in the blazing sun really close to noon with just a few clouds in the sky by this point. Yes, the lighting was tricky, but I was still finding very good subjects for the light. 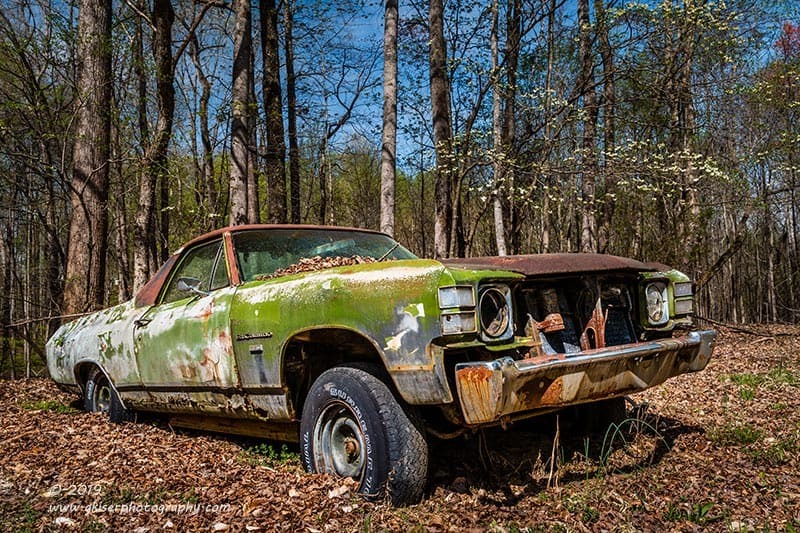 Another car that I had passed up on during my first round was a Pontiac Lemans which was not all that eye catching with the brown paint which had started to rust a bit. It was pretty, but didn’t hold that much flare for a photograph. Looking at it now I had another idea. Since color wasn’t really a concern for me here, I decided to pull out the monochrome though process and work something that way. I got down low (my knees were really starting to dislike me at this point) and framed up a vertical image showing the signature headlights with the engine badge on the fender. I let the chrome sing for this one and exposed to the right a good bit. There wasn’t much texture in the fender, but that was fine with me. This shot was all about the headlights and the badge anyway. I shot two versions of this with slightly different compositions and found that this one held up better than the other one. There was still something missing though. I wanted to get the grill, and for me to really capture this grill, I was going to need to be on the other side so that I could get the Pontiac emblem that was still fastened to it. For this one, I went with a more normal horizontal composition. I was still able to get the headlights, but the grill was pretty important here, so I wanted to emphasize the horizontal more than the vertical. I lost the impact of the engine badge, but you can still make it out in the right edge which gives some added visual interest to the fender. 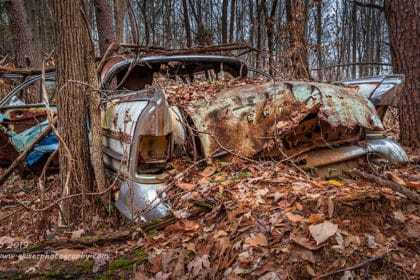 This is just one of those images that prompts you to imagine the rest of the car which then causes you to continue looking for more clues. If I am right, this image will keep somebody busy for a nice long time as they explore all the facets in the frame. Doing this as a high contrast monochrome really helps with that as well because you are focusing on the chrome and stainless trim more than anything else. 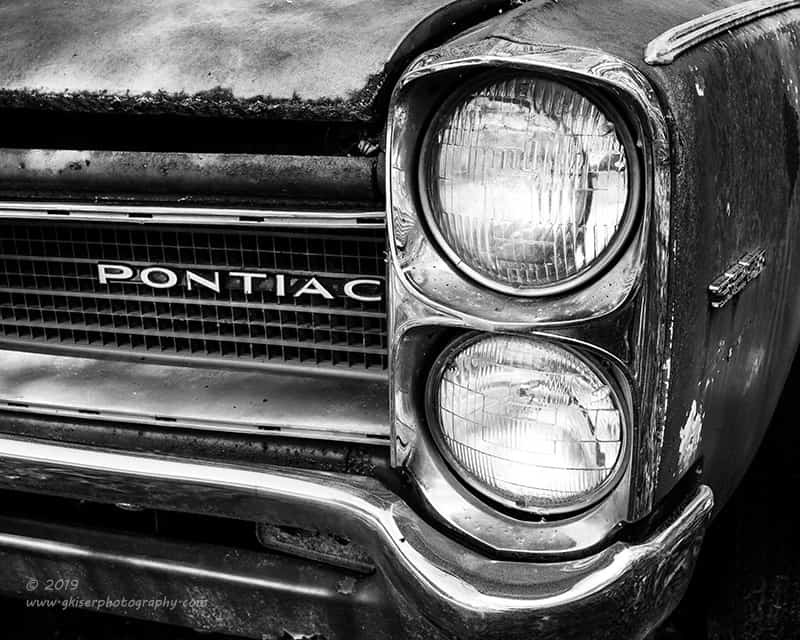 There was one section on this Pontiac that really did have some nice textures and shading. 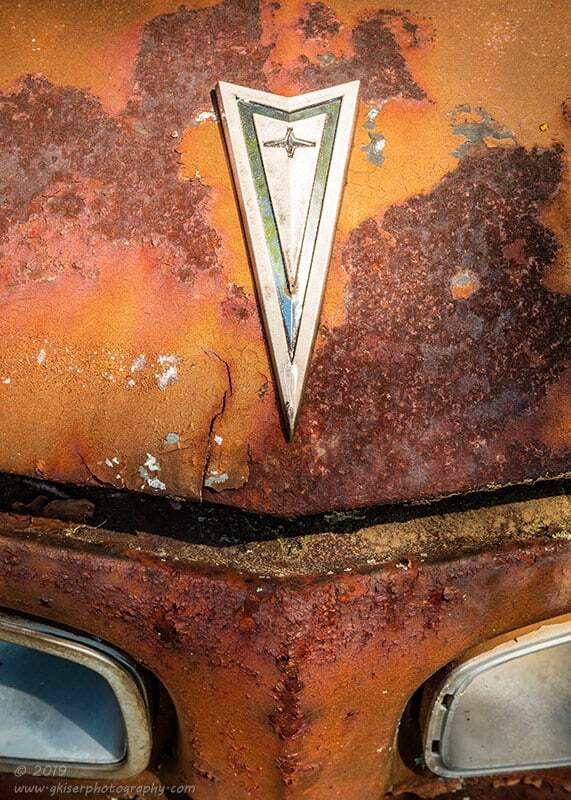 That was the hood right at the Pontiac emblem. I decided to get one more shot of this car before moving on to the next subject. I had to do some pretty careful placement of the camera to get to this angle. I was pretty well over the top of the hood, leaning the camera over. I used the grill ends to provide a lower framework for the image and allow some balance with the gray tones. The predominant color of the image was the rusty brown, and the textures added to the excitement. I was really lucky because just a matter of millimeters to left was the shadow of the camera. I was able to frame this dead on without getting my shadow in the frame. That was the lucky part. The unlucky part was after I got this image, the camera decided to……Remember this picture from earlier? Well, this was just about to happen. My camera decided that it hadn’t had quite enough just yet and wanted more. 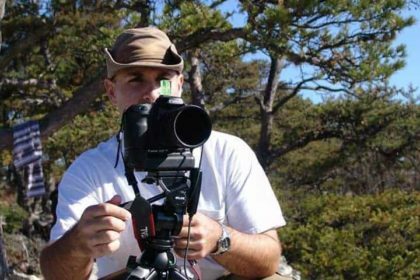 Never fear, the camera is just fine. I had no problems with the Pontiac and everything went very well as a matter of fact. It was my next subject that has led to all the hoopla about my camera. I decided to go back to the Plymouth that I had started the day out on. There was this great section on the windshield that I wanted to capture with the sunlight hitting it so brilliantly. Now does it make sense? I just loved how this windshield looked in the sun. I had to get the camera set up to shoot it as an abstract. The colors were just amazing with the mold forming in the cracks and the highlights against the shadows. Of course when I saw the picture in the LCD of the camera I thought it looked really cool, so I shot the picture of the back of the camera to sent to Toni who was at work. Her reply was to call me to see what had happened to the camera. 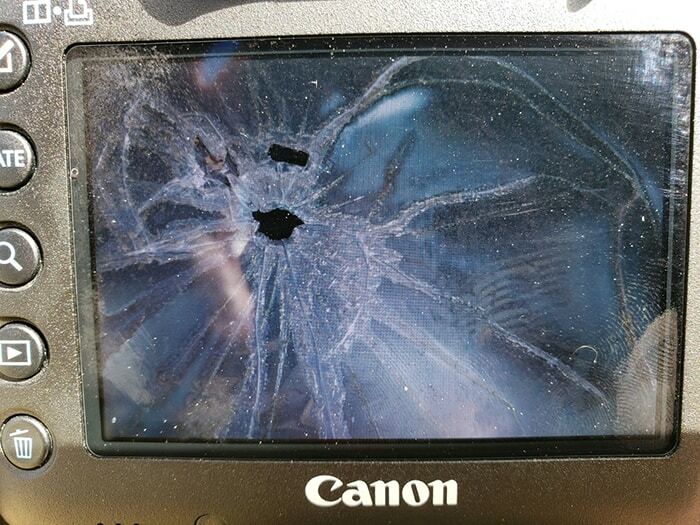 It was at that point that I realized that it looked just like the LCD had shattered. Hmmmm, how can I make use of that interesting fact? What better way than to post it to Facebook. Oh man did the comments start flying over that. I had more comments in two hours than I normally get on my best images. At least I know people are paying attention as they scroll. It was a lot of fun, and I figured that it would build a little bit of interest for this entry to boot. 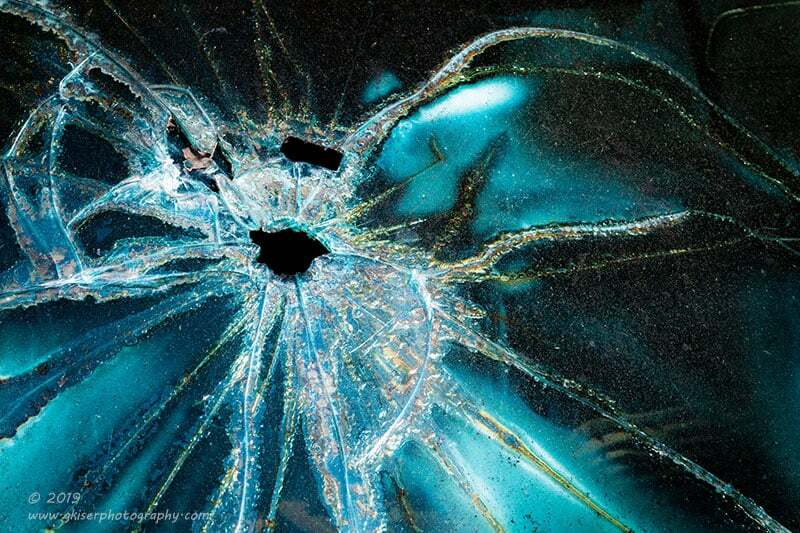 These are the resulting images from that whole incident. I promise, the camera is just fine, and I haven’t had a stroke (natural result of breaking the camera). These were just a lot of fun to play with. I’m not convinced that I’ll put them in the gallery just yet, but for an abstract texture shot I really like them. The pollen bothers me a little on the glass, but that is part of what it is to be a photographer this time of year. I was covered with the stuff from being outside all morning long and my camera was even showing some yellow buildup here and there. It was all very much worth it though because this turned into a very successful trip. Things really turned around from how the day started. I just wish the conditions had held a little longer than they did. Fortunately, I was able to make use of the sun at least. All in all, I had a tremendous day with 83 exposures over about three hours time. Of those, I ended up with 22 keepers which is just about unheard of for a hit rate. What an awesome morning! Here it is at 10:15pm and I’m just getting wrapped up writing about the day. Whoever said that being a photographer was easy is an idiot. My day got rolling at 8:20am, and I still have at least another hour to hour and a half before I can consider this day finished and go to bed. To wrap things up, remember that card that I left in the door where that Pontiac sedan was sitting? Well, while I was editing my photos, I got a call from the owner. I guess I can chalk this up to one of those times when leaving a card actually worked out. We spoke for about 15 minutes or so and after I explained what I did, I got an open invitation to photograph not only the car that I have been after for a month, but also anything else on the property that I wanted to capture. Talk about a lucky break. Now I don’t have to worry about catching him at home when the weather is right. 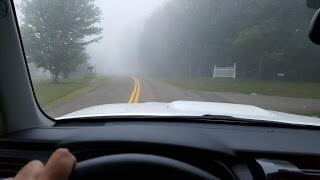 I can just go there when I know the conditions will work and have a great time working that car. I have some plans for it, and they will work just fine with a little extra green in the trees which is a good thing for sure. Bare trees are about to be a thing of the past.